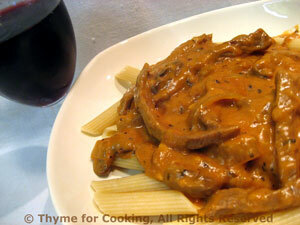 Savory Beef Stroganoff over Pasta, Thyme for Cooking easy gourmet. The paprika, Worcestershire and tomato paste add a depth of both color and flavor to this Stroganoff that you won't find in the more traditional, paler versions. Cook pasta according to package instructions. When done, drain and set aside. Peel and cut the onion, vertically, into 6ths. Brush any dirt off the mushrooms (see techniques) and slice, trimming off the tough stem ends. Slice the beef on an angle across the grain, then cut the slices into large bite-size pieces. Put flour and paprika into a medium food bag - large enough to easily hold the beef. Mix the flour and paprika, then add the beef. Shake to coat well. Heat 2 tsp oil in large nonstick skillet and sauté onions and mushrooms until onions are tender. Heat remaining 2 tsp oil in same skillet. Add beef and sauté until starting to brown, 3 - 4 minutes. Add beef stock, onions, mushrooms, basil, tomato paste and Worcestershire sauce to skillet, stir to combine, cover, reduce heat and simmer 5 - 10 minutes. Dissolve cornstarch in remaining 2 tbs of beef stock and stir into pan. Continue stirring until quite thick.